Bodhi is a very playful kitten. He loves to have his ears massaged and to be held. He wants to be right by his owner and will follow you around. He is extremely social and would love a playmate who can love him unconditionally. He loves all animals and people and is litter box trained. 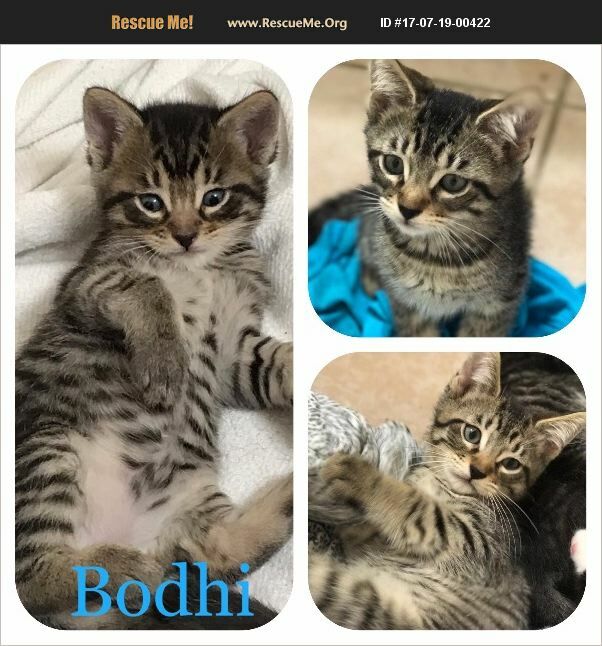 Bodhi is one of 4 kittens born on May 6, 2017. He has been handled since birth ato help make him a very social companion. Will be neutered, chipped and fully vaccinated prior to adoption. Adoption fee covers the cost of his medical care. The foster is not equipped to longterm foster active kittens so we need to find placement for Bodhi and his siblings (and Dad) soon so they are going to loving homes instead of a shelter. Please help us.